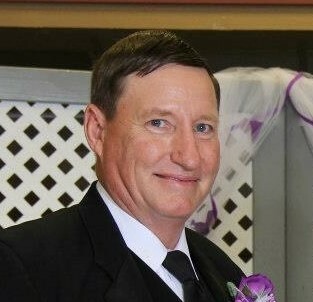 Dwight Lee Richecky, 65, of Hays was born to Larry and Irene (Fisher) Richecky on August 17, 1953 in Belleville, Kansas and passed away on August 22, 2018. Dwight grew up in rural Cuba, Kansas on the farm. On March 22, 1975 he married Debra (Zurfluh) Richecky in Agenda, Kansas. To this union, two daughters and a son were born. Throughout his life Dwight worked in many areas related to heating and air conditioning, plumbing, and electrical. His biggest joys and loves in his life were his children, grandchildren, and his faith. Some of his happiest times were taking his grandchildren fishing, watching ballgames, and working on the home with his family. He loved attending his grandchildren activities. His faith brought him great comfort and joy. He leaves this legacy on to his family. He is preceded in death by his wife Debra Richecky and his father Larry Richecky. He is survived by his children, Jaime Fallesen of Dallas, TX, Lacy (Adam) Paredes of Wichita, KS and Jeff (Amy) Richecky of Hays, KS. Mother Irene Saip of Enterprise, KS; Brothers Ray (Diana) Richecky of Wichita, KS and Jerry (Shirley) Richecky of Belleville. Grandchildren, Jaden Fallesen of Dallas, TX, Kasen, Addelyn, Rosalind and Lincoln Paredes of Wichita, KS and Carson and Landon Richecky of Hays, KS. Visitation will be Sunday, August 26th, from 1:00pm to 6:00pm at Tibbetts-Fischer Funeral Home. Funeral Services will be Monday, August 27th, at 10:00am at the First United Methodist Church in Belleville. Burial with Military Honors will follow at the Belleville City Cemetery. Memorials may be made to the family’s choice. Tibbetts-Fischer Funeral Home assisted the Richecky family with arrangements.